Professional Educators of Tennessee (PET) recently released their 2014 legislative agenda. They have three key areas of focus for the upcoming legislative session. 1) Teacher Licensure. PET is asking for a straightforward, common sense appeal process to address concerns regarding the proposed changes to teacher licensure. PET has also been asking for the suspension of the use of TVAAS data until Common Core is fully implemented. The group also mentions a need to focus on teacher remediation and targeted professional development. 2) Student/Teacher Data. PET is seeking legislation that will ensure the privacy of both student and teacher data. Specifically, they want to ensure no personally identifiable data on students and their families religion, political affiliation, psychometric data, biometric information, or voting history is collected or otherwise tracked and that such data is not provided to either the federal government or private vendors. They are also seeking limits on who may access teacher evaluation data. 3) Testing. PET notes the “overuse of testing in our schools” as a key area of concern. While PET notes that testing comes with good intentions, the result of an increased focus on testing is now a “detriment to public education.” PET suggests policies that find a balance between the need to assess in order to gain knowledge about what’s working and what’s not working for kids and the over-reliance on tests for uses beyond their intended, useful purpose. Memphis teacher and blogger Jonathan Alfuth writes about strategies for retaining educators in an urban environment. This past June, I completed my second year as a Teach for America teacher. I’d worked in one of the most struggling high schools in Memphis but rather than being scared away, it strengthened my commitment to teaching. Yet I knew that there was no way I’d return to my placement school. The culture didn’t promote student achievement, individual teachers operated in isolation and we had little shared vision for where we were going as a school. Over the next few weeks, I did a comprehensive search of schools across Memphis. While I turned up several schools that I believed embodied the type of culture I desired, none of them were Shelby County Schools (all were charter). I made the choice to move to a charter school and I’ve been amazed by the difference in culture and its impact on student achievement. Our leaders are hardworking and dedicated to a common mission. My colleagues and I are given common planning time in content and grade level teams each and every week. And most importantly, we work together to develop the kind of school culture that drives students to success. I see its impact each and every day in the quality of my students work and their academic outcomes as so far, 100% of our graduating students have been accepted to 4-year schools. I often find myself thinking that we’ve done so much to improve education both here in Memphis and across Tennessee. We’ve reformed teacher evaluation to identify our best and brightest. We’re on the verge of dramatically reforming teacher compensation in Tennessee. And yet all this means NOTHING if we cannot keep great teachers in high need classrooms once they are placed. This begs the question; what do educators really want? What will keep them in district classrooms? In my experience, young education professionals, TFA or otherwise, aren’t much different from most other young professions. We all have highly varied motivations for entering the profession. But in the end, great teachers gravitate towards environments with great school and district leaders, great office (or in this case school) culture that focuses on achievement and great colleagues that work together to achieve a common vision. I am a TFA alumni but I also work closely with young educators from both alternative and traditional certification programs. And I believe strongly that my decision is one that almost every young educator in Shelby County faces at some point in their first two years. At the end of two years, many young educators, TFA or otherwise, feel a strong sense of commitment to their children and a desire to continue in education. However, we are often placed in such dysfunctional environments that we have to make a choice which feels like choosing between being a martyr for our kids by staying or abandoning them by quitting or moving schools. And so often the challenges inherent in district schools make the former untenable, and so we leave, either choosing a different school like I have or leaving the profession all together. I should add that some schools in Shelby County have found a way to make it work and retain young educators beyond their first few years. Colleagues of mine at Ridgeway High, Whitehaven and Kingsbury High consistently tell me about the strength of their school leadership and the support they receive from their colleagues. We should certainly study these schools further, but they represent the exception rather than the norm. Until district leaders devote attention to improving school cultures to make them attractive and professional work environments that attract young educators, we will continue to see an exodus of young teaching talent to other systems, schools or professions. And it won’t matter what program those educators come from if conditions are so challenging that teachers can’t fathom working in high need environments. We can extend or eliminate contracts with organizations like Teach for America, but that won’t fix the underlying fact that many young educators simply don’t feel that the school culture where the work is one where they can be successful. I don’t want to leave this post without offering some solutions. I’ve already written a seven part series on a package of strategies that could be used to promote teacher retention in SCS, so I won’t rehash it here. If you’re interested in some research based strategies for how we could start building the types of school cultures that attract and retain high quality educators by enacting district level policies, I invite you to check the series out here. Want to know who is “responsible for the dramatic improvement of student achievement” in TN? Today is the first day of the Tennessee Principals Association annual conference. The topic of this year’s conference is Leading in the Common Core Era. The conference will have three keynote speakers to discuss Common Core. 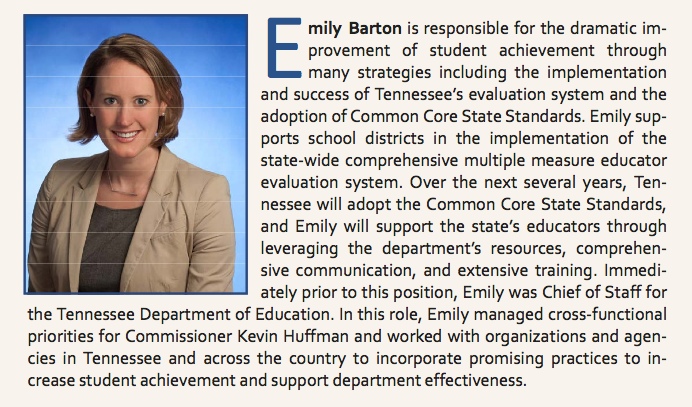 Emily Barton, Assistant Commissioner for Curriculum and Instruction, is one of those keynote speakers. The first line of her biography tells a lot (see picture below). Looks like Emily Barton is solely responsible for the gains in achievement. That’s a huge claim to make at a conference filled with educators. At a working session last night, the Knox County School Board announced a collaborative effort to push for transparency in the Tennessee Value-Added Assessment System (TVAAS). The idea is to ensure that teachers understand the inputs that create the value-added score that makes up 50% of their overall evaluation in the TEAM model. Finally, the board is collaborating on a resolution to be delivered to the legislature to urge, if I understood correctly, legislators’ assistance in ensuring that the mechanics of TVAAS be made understandable to teachers. Bill Sanders, creator of TVAAS, has been reluctant to give much detail about TVAAS over the years. As the story explains, it seems that there could be a push for using a different model that is more transparent if the current value-added model can’t be made transparent. While there are doubts about the validity and reliability of TVAAS data in general, at the very least, the method for arriving at a teacher’s score should be made transparent. Lots of other happenings at the meeting. Read more here. A group of Tennessee moms is asking tough questions and raising concerns about education profiteering right here in the Volunteer State. Here’s their Top 10 list of ways to get rich being an education industry profiteer. The list is followed by lots of handy links to stories you may not hear often or may not remember. By a vote of 9-6, the Texas State Board of Education rejected an application by Great Hearts to open four schools in the Dallas area. It’s not clear why the Board rejected the application, as the Board has a reputation for approving Charter Schools. Of course, the Great Hearts Controversy in Nashville prompted legislation this year to create a state charter authorizer. That legislation failed to pass due to some last-minute problems between the House and Senate, but it is certain to come up again.